Freewheel - "may well be the song Neil Finn always wanted to write." they said. "Freewheel's melody is as catchy as MSRA." they said. "Has hit written into its DNA." they cried, and even Jack White had a few good words to say! But we think it's just plain lovingly crafted antique popular music and with the vinyl includes a fab comic and a free download of the tracks, if you don't have your 78 player to hand. Duke Special, essentially one chap, Peter Wilson, the Duke is a man with an obsession with the musical capabilities of the past. Not afraid to entertain the idea of three minute pop songs nestling up against the quirks and charms of the sound of music hall, Duke Special has succeeded in creating something that sounds both new *and* old-fashioned. 'Adventures In Gramophone' album. On it the Duke demonstrates his way with a heartfelt poetic lyric and a singalong chorus. The sound is pretty much like that of Badly Drawn Boy's smarter, slightly stranger brother. In a time where the world falls at the feet of the likes of David Gray, it's most welcome to find there's someone who deserves plaudits for being alternative to the alternative, i.e. good. Pete Wilson could have made such a hash of the whole thing, but it's altogether gorgeous. 'Something Might Happen', the second song is an absolutely heart wrenching ballad with nothing but voice and piano. Soundtrack to 'The Company Of Olympian Bird Gods' employs the Duke's beloved gramophone, it's got a crackly 'birds of Britain type' feel, interspersed with reverential chanting, thumping drums and vague instrumentation. A suitably odd way for the lad to finish off this E.P. The single is available for download all over the place, so you can go listen for yourself. The special edition 78rpm 10-inch vinyl will include bonus tracks, including 'Something Might Happen' recorded live at Howard Jones' house! singer songwriter duke special releases 'freewheel' as the second single from his acclaimed 'adventures in gramophone' album. resident in belfast and carrying within his songs hints of the city's music hall legacy, as a writer and performer duke special cuts an interesting dash. as likely to be found alone at a piano with only a wheezing old gramophone for company as he is to be surrounded by a vaudeville orchestra of musical cohorts. 'freewheel ' comes with heartbreaking falsetto flurries, and is the song neil finn always wanted to write. the single is released as a special edition 78rpm 10-inch vinyl with free downloads and amazing comic. 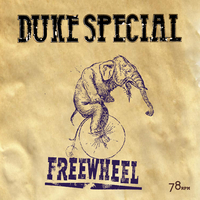 Unfortunately at this time we can't offer all the Duke Special - Freewheel EP tracks as individual mp3s, as some of these tracks exceed the shops maximum (9mins) download length.